We’ve all probably seen our share of wild police chase videos, but this one was a little less fast-paced than usual. 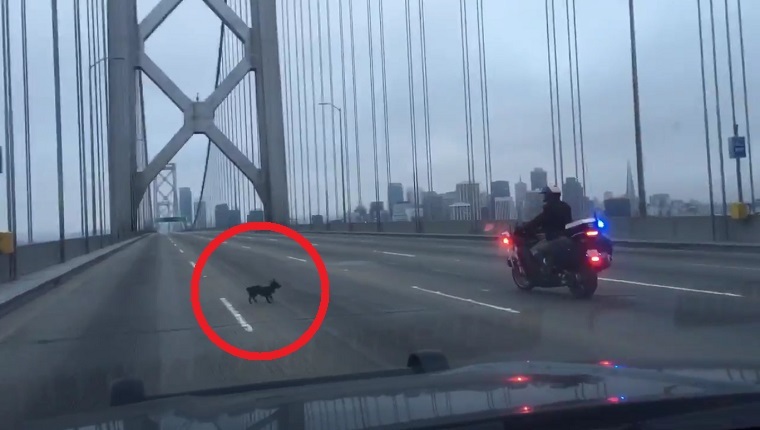 A small Chihuahua ran onto the Bay Bridge from Oakland, California and made a break for it to San Francisco. Police were hot on the pup’s tail, and even shut down traffic to stop the frightened pooch from being injured. The heart-pounding action was all recorded from a police vehicle as an officer on motorcycle pursued the pup while maintaining a safe distance, just in case the dog pulled a gun or something. Police set up several road blocks, but the elusive Chihuahua just ran around them. Eventually they were able to box him in and took the dog into custody. The fugitive was handed over to the San Francisco Animal Care & Control who brought him to a local shelter. They are working to find the dog’s owner, but in the meantime they’ve taken to calling him Ponch after the character from the television show CHiPs. Hopefully this canine’s days of fleeing from the law are over. Did the video make you laugh? Were you rooting for Ponch the whole time? Let us know in the comments below!